You'd be impressed how an old barn looks like now! Home transformations are not new to us. We have seen many structures that were turned into homes and they all look really impressive. Although traces of the original structure are still seen, the homes still appear unique and beautiful both in the interior and the exterior. What add a different personality to the spaces are the layout, the furniture and the decorations. The result is a stunning home that is both cozy and attractive. Today, we are going to feature another impressive home transformation. 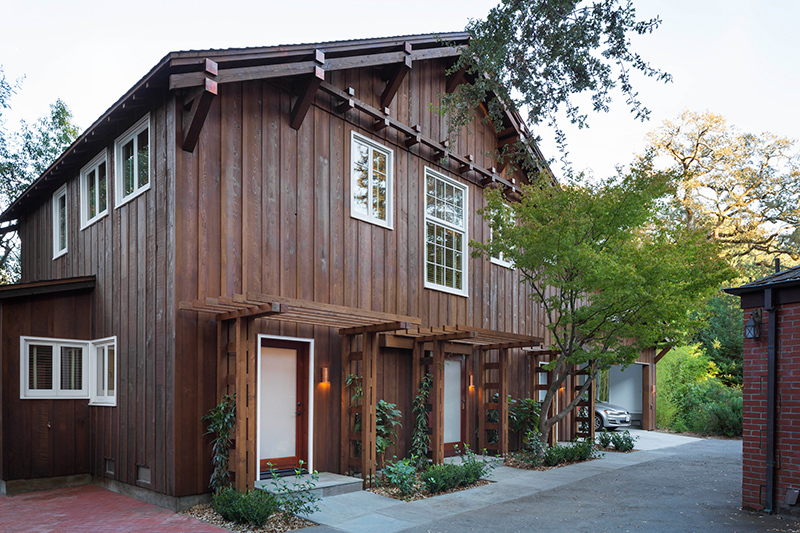 The Historic Barn is a project which turned an old barn into a contemporary home. The barn was constructed in the early 1900’s which is adjacent to the old NW Pacific Railroad right-of-way. Apparently, it was once a horse stable and was also used as a garage. Aside from that, it was also occupied as a guest house but it was damaged when water burst from the pipes. 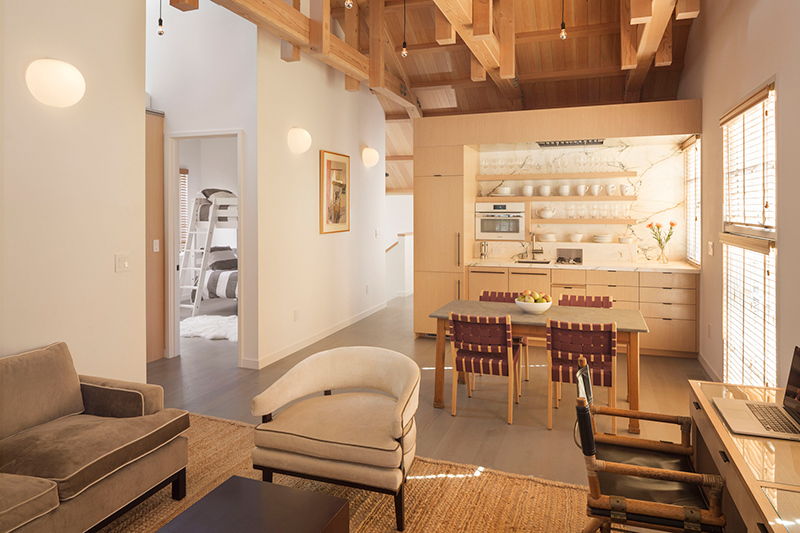 Despite the damage, Mill Valley architect Heidi Richardson managed to renovate the space and turn it into something that is useful and livable. Part of the renovation includes a seismic upgrade, flood proofing and also a reconfiguration of the upstairs living unit that features two bedrooms and a sleeping loft. Exposed roof trusses are used for the ceiling wherein some of them needed to be replaced because of dry rot and seismic stability. The end result of the project maintains the historic exterior of the barn while updating the interior using modern living standards. Seen below are the images of the Historic Barn sent to us via email. Unique feature: An old horse stable was turned into a stunning home with a combination of contemporary and barn style seen both in the interior and exterior. At first glance, you will instantly fall in love with this house not just because of its wooden exterior and the vines that are starting to climb up the walls but also because of its design. The use of white frames for the windows also look beautiful and contributed to the visual appeal and uniqueness of this home which was once a horse stable. The interior features grey floorboards that are a modern take on the typical barn flooring. You will also like the feel of this space because it is very cozy because of its colors and materials used. Even the arrangement is well done too. Whimsical schoolhouse lighting is used in the home’s interior which is reminiscent of an earlier era that adds scale to the space. 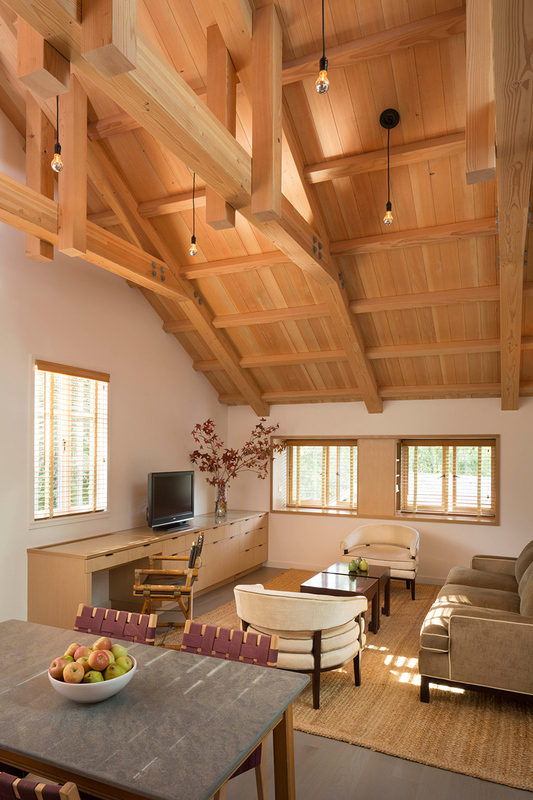 You can see lights suspended from its vaulted wooden ceiling which gives the interior more space. It also appears airy as well. You’d be surprised to see this part of the house. 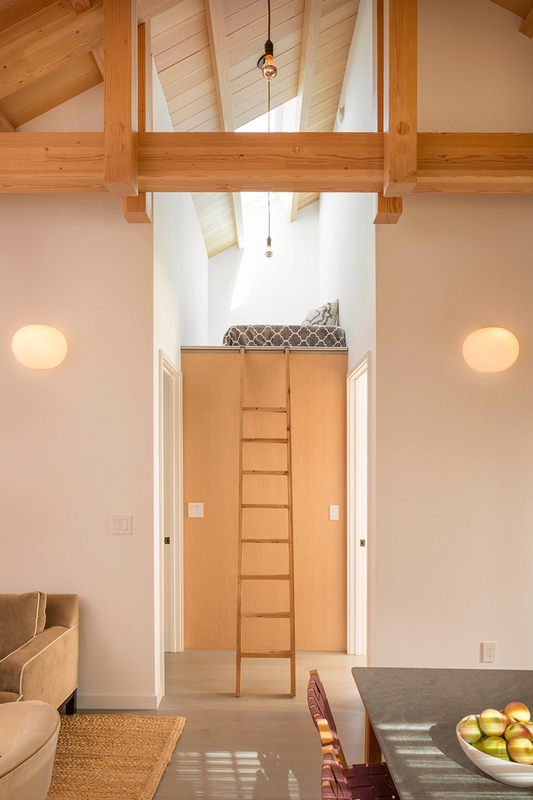 Instead of merely disregarding the area, they added a loft bedroom which is indeed a good idea. I also love the patterns they used for the bed covers which looks very modern. 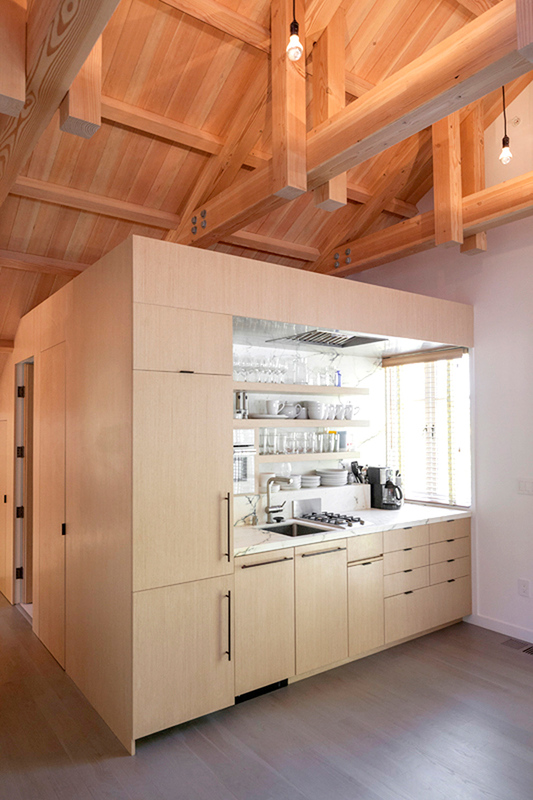 Inserted into the volume of the house is a kitchen/bathroom wood clad “service cube.” We have seen this kind of approach in some apartments and small spaces and it works well all the time. 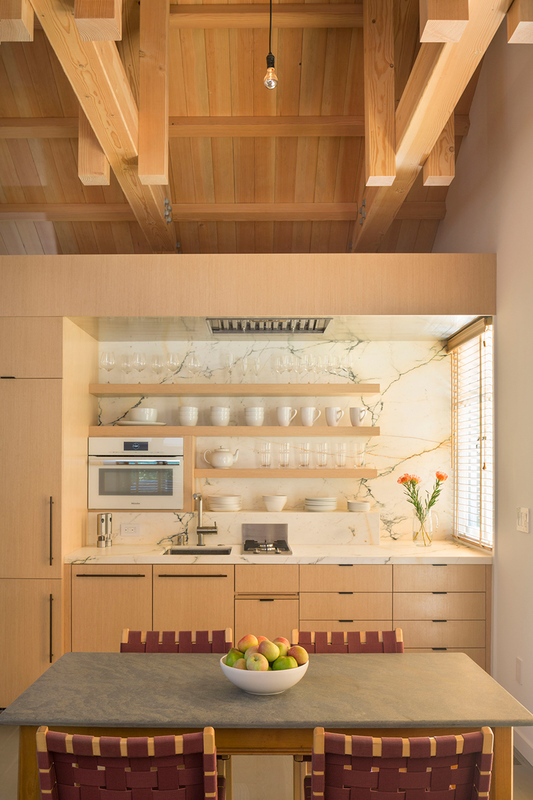 Seen here is the kitchen which used light wood for the cabinets. Notice also that it has a marbled backsplash that made it appear more interesting and neat as well. You can also get a glimpse of the dining area as well. Another look at the kitchen where kitchenware and dinnerware are neatly arranged. Notice that there is a window on one side of it which brings light to the area. You can also see here the door that leads to the bathroom. 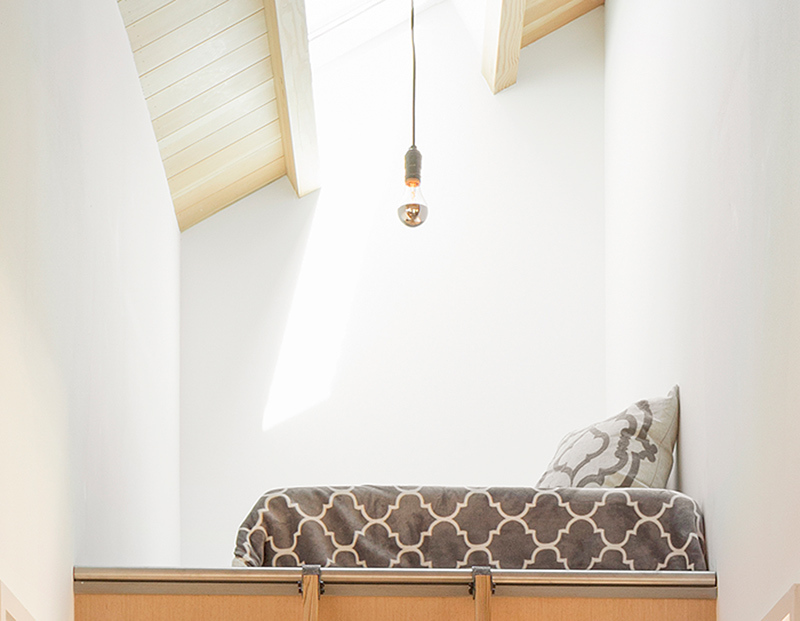 A closer look at the loft bedroom which has a nice modern pattern for its fabric. It is also neat and minimal since there isn’t much on it. During the day, one doesn’t need to use electricity for lighting since it has a skylight just above the loft bedroom. This is part of the service cube that also holds the kitchen. 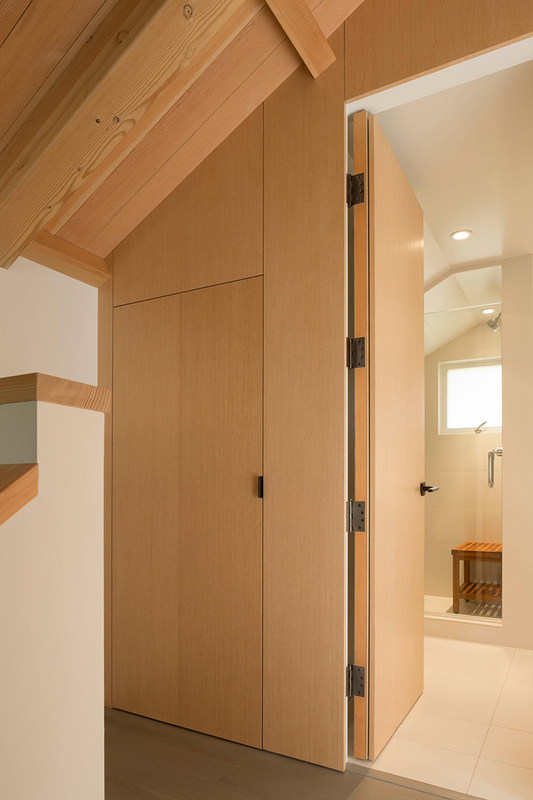 This one leads to the bathroom which features a glass enclosed shower area. Isn’t this impressive? For sure, you did not expect that a humble horse stable could actually look this beautiful. Notice that aside from its well-designed interior, its exterior also looks great. What I love here is that they were able to retain some features of the Historic Barn which is a good thing. At least that way, guests will be able to appreciate how much change the structure went through in order to be turned into a home. This impressive transformation is a project of architect Heidi Richardson of Richardson Architects. The lovely images you have seen above are from Jeff Zaruba. For sure, you can get a sound sleep in a house like this where you can dream of galloping horses instead of hearing them for real!